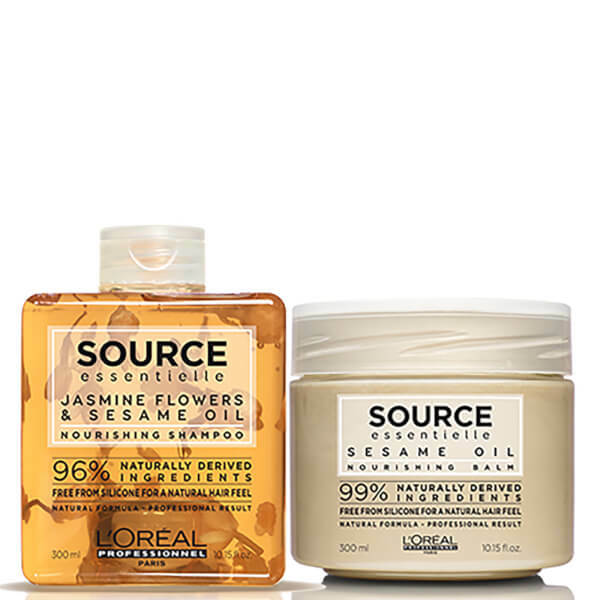 Treat dry, damaged hair to the benefits of L'Oréal Professionnel Source Essentielle Ultimate Nourishment Duo; a daily shampoo and a rejuvenating balm that work in tandem to cleanse, replenish and restore shine from root to tip. A deeply nourishing treatment that can be used daily to maintain soft, silky locks. Enriched with Sesame, Sunflower and Argan Oils, the reparative hair mask replenishes and revitalises, whilst restoring suppleness and shine from root to tip. Works in just five minutes to leave tresses feeling restored with minimised frizz and a salon-worthy finish. Balm: Apply evenly to shampooed, towel-dried hair. Leave on for 5 minutes. Rinse thoroughly. Balm: Aqua / Water, Cetearyl Alcohol, Helianthus Annuus Seed Oil / Sunflower Seed Oil, Stearamidopropyl Dimethylamine, Cocos Nucifera Oil / Coconut Oil, Cetyl Esters, Candelilla Cera / Candelilla Wax, Caprylyl Glycol, Argania Spinosa Kernel Oil, Glyceryl Stearate, Tartaric Acid, Sodium Benzoate, Sesamum Indicum Seed Oil / Sesame Seed Oil, Caramel, Coumarin, Geraniol, Limonene, Parfum / Fragrance (C216875/1).